I am Kumar Bk from Dhading district four chalish Village same village as our Nepal wilderness trekking agency owner Himal Ghale. When I was in Kathmandu for my college study in 2012, there was a summer holiday, and I joined as trekking porters from Nepal wilderness trekking agency. After that, I keen interested in doing Trekking and learning all the Himalayas highlander trekking destinations, cultures, trails etc. 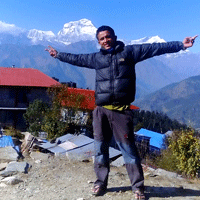 now I am a fully guiding for all Trekking destinations of Nepal with full of knowledge experience.